Private Asset Management (also known as PAM) is a magazine for the wealth management and family office industry. It is headquartered in London. The magazine is published by Pageant Media on a monthly basis. The May 2017 issue of the Private Asset Management (also known as PAM) magazine. One of the major articles concerns the 50 women who have been identified as the movers and shakers in the investment industry. ABOUT THE PRI ... WHAT IS THE PRI? The PRI is the world's leading proponent of responsible investment. Most of the following initiatives to establish methodologies for reporting impact are NOT based on accounting for impact, but on a methodology heavily oriented to questionaires ,,, a process that is unreliable and expensive. In contrast the TVM approach to numbering impact is based on a methodology very much like standard costing in conventional accounting, with a standard value profile being at the center of the approach! September 2015 ... for Barlays, a bank. A year ago, [that is 2014] Sir Ronald Cohen, the chairman of the G8 taskforce on impact investment, challenged policy-makers and other interested parties to take up the group’s recommendations in order to “bring the invisible heart of markets to guide their invisible hand”. With this paper, Barclays aims to play its part in delivering on that challenge. We look forward to hearing the contributions of many others. TPB Note: Not sure why this paper is attributed to John C. O'Connor ... it seems to be a paper prepared by Barclays Bank based on a series of opnion surveys more than anythng else. GSIA Definition of Sustainable Investing Sustainable investing is an investment approach that considers environmental, social and governance (ESG) factors in portfolio selection and management. 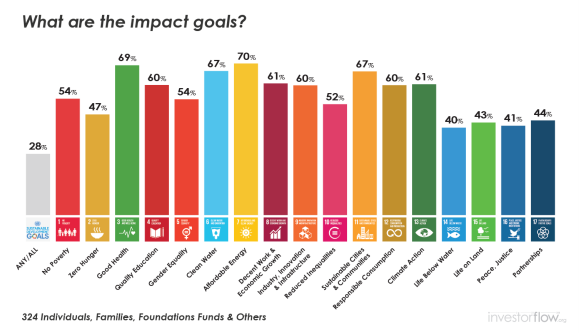 For the purpose of this global report and for articulating our shared work in the broadest way, GSIA uses an inclusive definition of sustainable investing, without drawing distinctions between this and related terms such as responsible investing and socially responsible investing. These are collectively referred to as sustainable investing or SRI. 7. Corporate engagement and shareholder action: the use of shareholder power to influence corporate behavior, including through direct corporate engagement (i.e., communicating with senior management and/or boards of companies), filing or co-filing shareholder proposals, and proxy voting that is guided by comprehensive ESG guidelines. The sum of these individual strategies, after adjusting for double counting since some assets are subjected to more than one strategy, results in the sustainable assets under management included in this report. In the report the aggregated figure is referred to as sustainable investment or investment taking into account ESG concerns, without making a judgment about the quality or depth of the process applied. impact measurement and accountability As a result, impact measurement and accountability will need to be developed in the private sector, as has been called for by the Beeck Center for Social Impact and Innovation at Georgetown University, the U.S. Impact Investing Alliance and the New York Federal Reserve, among others.